The future of Opel and its German jobs has become a hot political issue before next month's elections. BERLIN/DETROIT (Reuters) - - Opel has the liquidity to operate until next year, a senior German government official said as a rift appeared to develop in the ruling party over whether the General Motors Co. unit should be sold to Canada's Magna International Inc.
German Economy Minister Karl-Theodor zu Guttenberg said that money provided to Opel by Berlin and the federal states that host Opel plants should last until around January. Separately, GM said there were still open questions that needed clarification over the Magna bid and a rival bid from Belgiums RHJ International. "GM remains engaged in discussions with the interested buyers, the German government and labor leadership, and any solution must be suitable for all vested partners," the automaker said in a statement released today. The developments come as talks drag on over a resolution of the future of Opel and its thousands of German jobs, a politically charged situation for German leaders ahead of the general election near the end of September. GM's board had been widely expected to choose on August 21 between selling an Opel unit stake to a group led by Magna, or RHJ, a Ripplewood-affiliated holding company with investments focused in the autos sector and Japan. The board did not render a decision. Instead, sources have told Reuters that GM was considering an alternative to hold on to Opel. 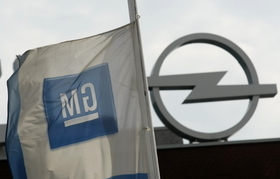 The board is not expected to convene until early September when Opel would be discussed again. GM's European operations posted a $2.8 billion loss in 2008, but Opel represents the heart of GM's small and mid-size car engineering and provides the technology behind key models such as the Chevy Malibu and the upcoming Chevy Cruze. GM's concerns about Magna in part have centered on the potential for Magna's Russian partners Sberbank and automaker GAZ to use GM technology to develop a competitive threat to its own Chevy brand in the Russian market. Opel has been surviving on a six-month 1.5 billion euro ($2.15 billion) bridge loan from the German government that matures at the end of November, when a new investor has been expected to take control. Guenther Oettinger, a senior member of Chancellor Angela Merkel's Christian Democrats, said today that Magna is not necessarily the best bidder for the carmaker. "It's of secondary importance who the owner is," Oettinger, CDU premier of the southern state of Baden-Wuerttemberg, told the Rheinische Post daily. "I think Magna can do it, but I don't rule out others being able to do it as well." Oettinger's state is home to roughly one-eighth of Germany's population. Daimler and Porsche are based in his state, but there are no Opel plants. Merkel's government has repeatedly stressed its preference for Magna, and has offered to provide billions of euros in aid if GM gives Magna the nod, passing over RHJ.